Another split has opened in freshmen ranks over the politics of any talk of impeaching Trump. Hours after the new Congress was sworn in Jan. 3, Tlaib was recorded telling a friendly interest group that “We’re gonna impeach the mother—-er,” referring to Trump. More than the expletive, her vow to impeach Trump incensed Democrats who had labored to abstain from any such talk until special counsel Robert Mueller reports on his investigation into Russian election meddling. 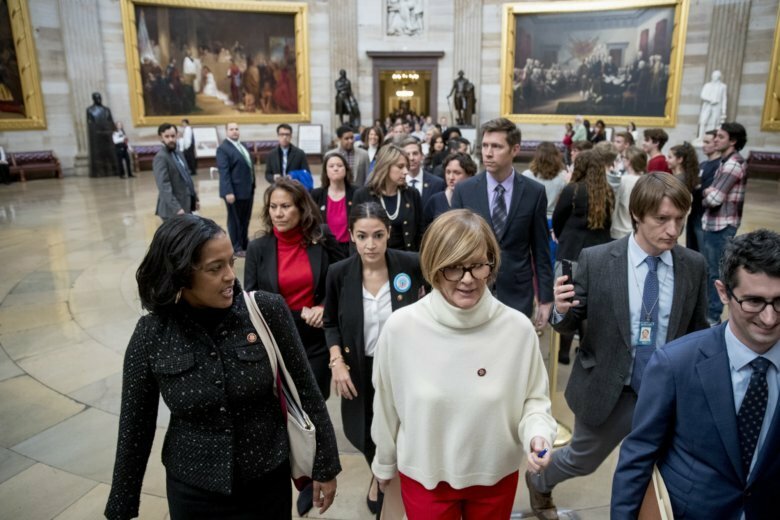 As the story overtook the party’s messaging on the government shutdown the next day, Tlaib took what she described as an “intense” round of schooling from veteran Democrats about the consequences of speaking bluntly while a member of Congress. Tlaib said she was sorry for the distraction. Other freshmen strove to avoid commenting on the upheaval largely because they think such talk right now would detract from their mission to preserve national health care and other priorities they had campaigned on. Some even went so far as to say they’d prefer Trump as their foil to Vice President Mike Pence, the former Indiana governor and House member who would be president in the so-far unlikely event that the House impeaches Trump and the Senate removes him from office.